If you have ever wanted to take your crafting supplies with you on a vacation or to a friends house, then you know how necessary it is to have a good tote to carry everything in. You don’t want to throw everything into a bag where things can get lost easily. You want a storage container with separate pockets, zipper compartments, and loops for easy retrieval. 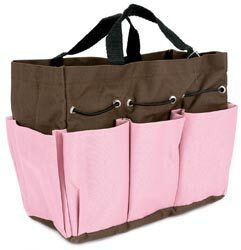 Shopping for a craft tote can be just as fun as shopping for a purse. Any savvy crafter will want to be styling while on the go so taking care to find the right bag is a must. Since I love to shop, I went on a search of some of the most stylish and functional craft totes that I could find. I’m pretty sure you will like what I came up with. I love the functionality of this first tote by Craft Mates. You can buy this from Fire Mountain Gems for about $40. The price seems worth it though for all of the storage compartments that it packs in. It includes six 14 compartment plastic caddies that lock individually so they won’t accidentally open and spill out the contents. There are two spacious tool pockets on the outside and three more on the inside of the tote. A large back pouch is great for storing paper, magazines or patterns. The soft shoulder strap makes toting this bag around easy. I would recommend this tote for beading supplies, scrapbooking or sewing. It can really be used for just about anything! This tote by A Walk Down Memory Lane is a great option for a very little cost. At $3.99 you almost can’t go wrong. The color and styling is fun and functional too. It has seven pockets around the main bag to fit several different supplies. It can be used for a wide variety of crafts. However, I would recommend it for knitting, painting supplies, or any craft that doesn’t require tiny parts. All of the storage pockets are open at the top so you do need to be a little careful not to tip everything out. This Hemline craft tote from Sears looks to be very durable and functional with its heavy duty commercial grade zippers and sturdy construction. There is a deep double pocket which is lined and padded for easy separation of supplies. You could easily add some small plastic storage containers in this roomy design. It is priced between the other two bags for about $20. The tapestry floral fabric comes in burgundy, blue or cream. Finally, I included another great option from Hemline offered at Sears. This mega tote is almost as good as the Craft Mates tote for about $10 less. It also has six plastic multi-compartment storage boxes. Four of them are extra large and two are medium in size. They don’t appear to be locking compartments though. There are also additional storage compartments at the sides and front of the tote. This tote could be used for a wide variety of crafts as well.